Editor’s note: Paul Doty ’64 was inducted into the Williston Northampton Athletic Hall of Fame on Saturday, June 7, 2014 during Reunion weekend. Frank Dorsey gave the following introduction during the ceremony. The ditto machine, long since supplanted by, in turn, mimeograph, Xerox, laser printers and ink jets was used to generate quizzes and, in my first year at Williston, a one page workout sheet for the lacrosse team. It included suggested exercises, recommended running and an exhortation to the players to work on throwing and catching with their “off” hand. The result of this exercise, running and practice was the naïve hope on the part of this then young coach that the Williston lacrosse team would become “ambidextrous supermen.” I’ll say more on that later after summarizing Paul’s athletic career. At Williston, Paul Doty lettered four years in swimming and three in lacrosse. He was co-captain (with Steve Durant) and the leading scorer (28 goals) and assister (16) on the undefeated (11- 0) 1964 team. He and Durant together out-scored the rest of the team (49 – 38) and also together had more assists than the rest of the team (30 – 20). 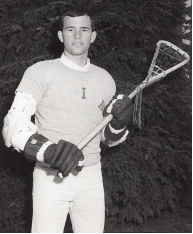 After that remarkable prep performance, he went on to Denison University where Paul was a two-time All American at attack; 3rd team in ’67 and 1st team in ’68. He still holds Denison’s single season assist record with 46 including 10 in one game. He is Denison’s second all-time scorer and was named to Denison’s All-Decade Team of the 60’s and to their 60th Anniversary Team. After successful coaching at the prep level, in 1973 he was named coach of the UNC Tar Heels. Paul took UNC from a national ranking of 50th to fifth, to two consecutive top 10 seasons, and to their first two ever NCAA Tournament appearances. He was selected as coach the 1975 South team for the annual North South All-Star game. Fortunately for Southern Oregon University, he’s again coaching, helping the red-tailed hawks to their conference tournament this year as offensive coach. Paul, in asking me to be his presenter today wondered (perhaps fearfully!) what story about him I would tell. Don’t worry, Paul. Paul’s Denison’s lacrosse team, on a Spring trip in 1967 or 1968 played Duke in Durham one day and UNC the next. I was in the stands near some UNC players watching and scouting the Duke-Denison game. Paul played very well, but the UNC players said “Not to worry, he’s all left-hand.” I told them that was interesting since he had been right–handed in prep school. So, I’m pleased to present Paul Doty ’64, ambidextrous superman, for entry into the Williston Northampton Hall of Fame. Boggling! Oddly, I remember the first appearance of Doty on campus when he first arrived (looking very much like “new boy”). Had an older brother at Williston, no? Would love to have Paul’s email. I taught in NC not far from UNC 1974, and wonder if Paul got a chance to witness on of UNC’s Tony Waldrop’s 3:50 miles?! Hey Dave, I did see Tony run, he trained right next to our lax practice field. Shame he got sick before the Olympics., he was something special. Here in Oregon still playing lax.